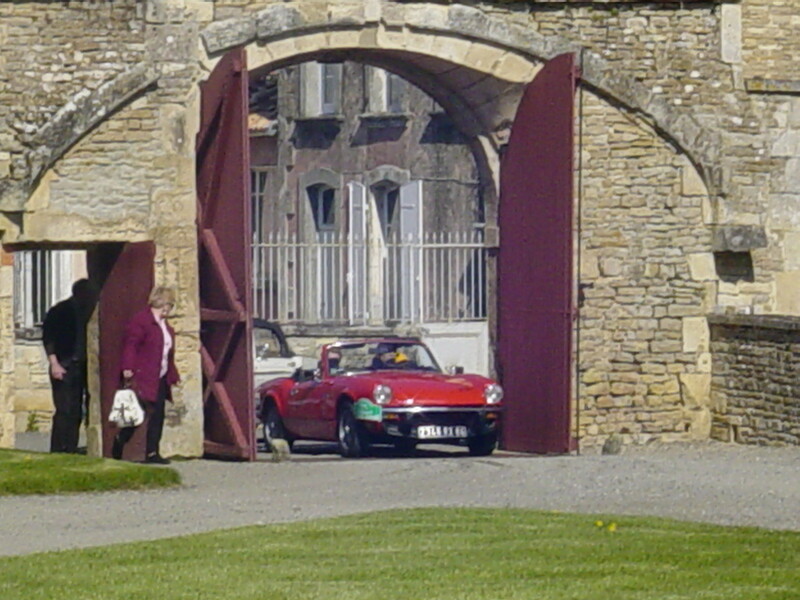 Beautiful and gleaming Triumph TR4 resting in the courtyard of the castle. 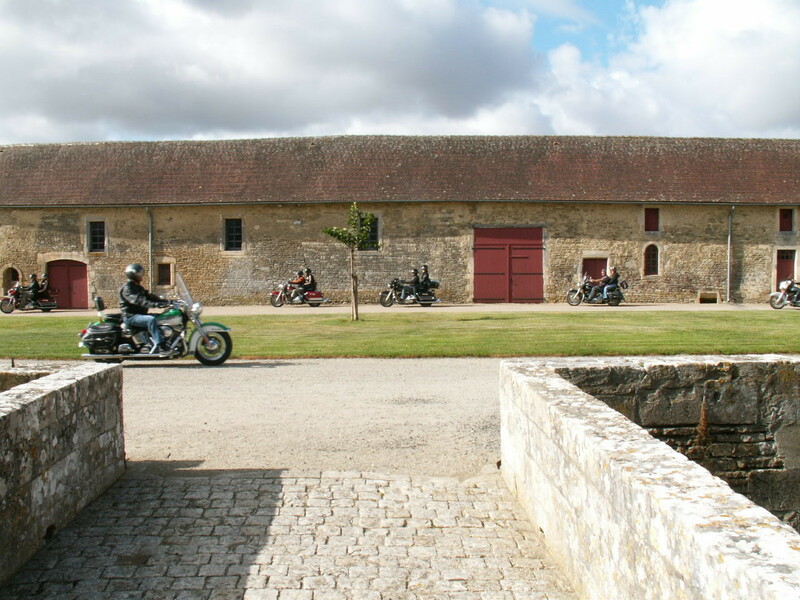 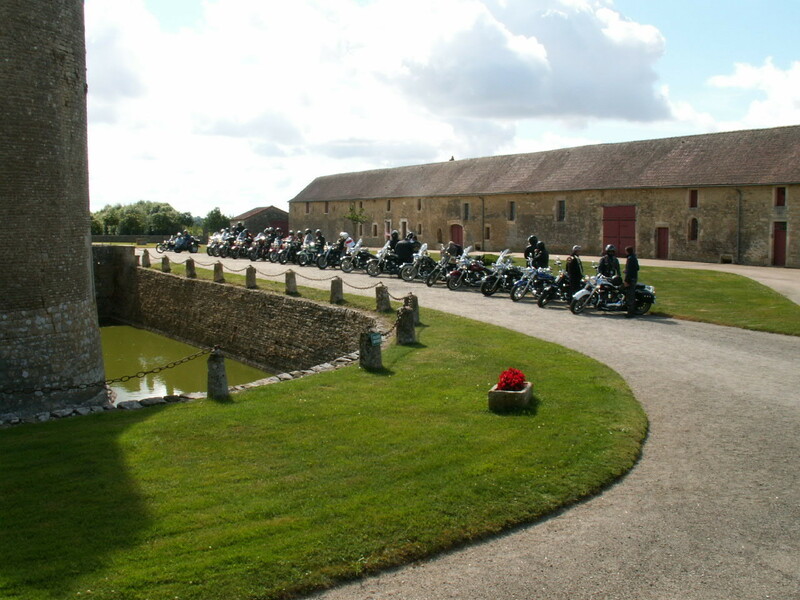 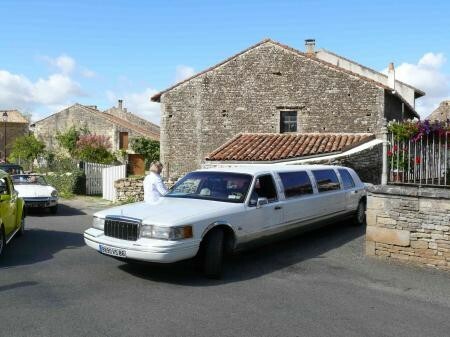 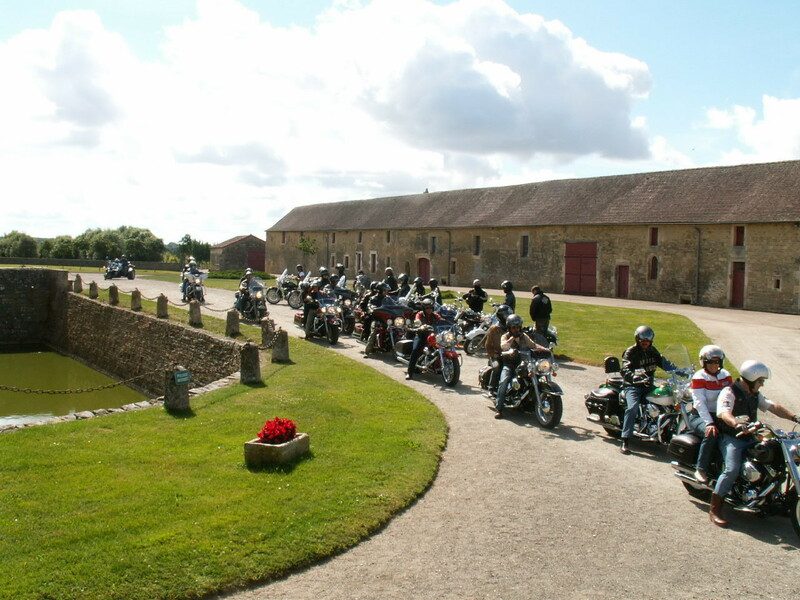 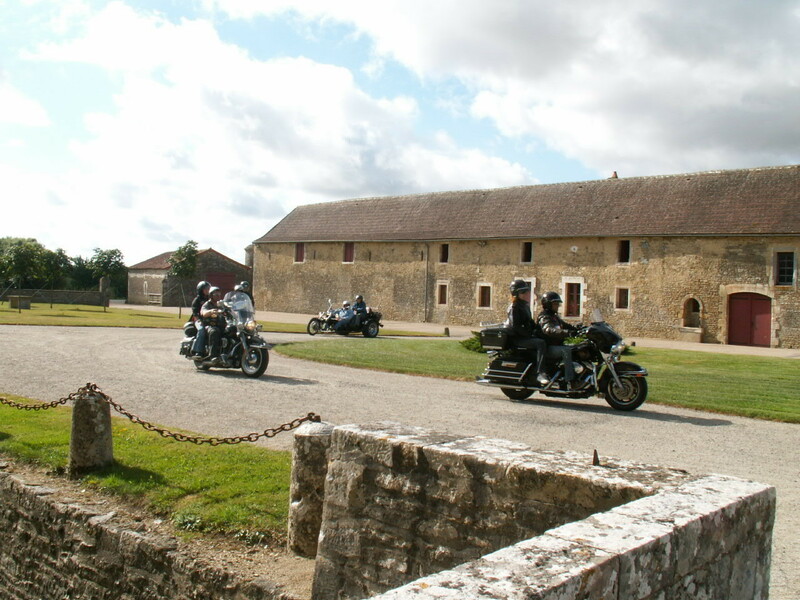 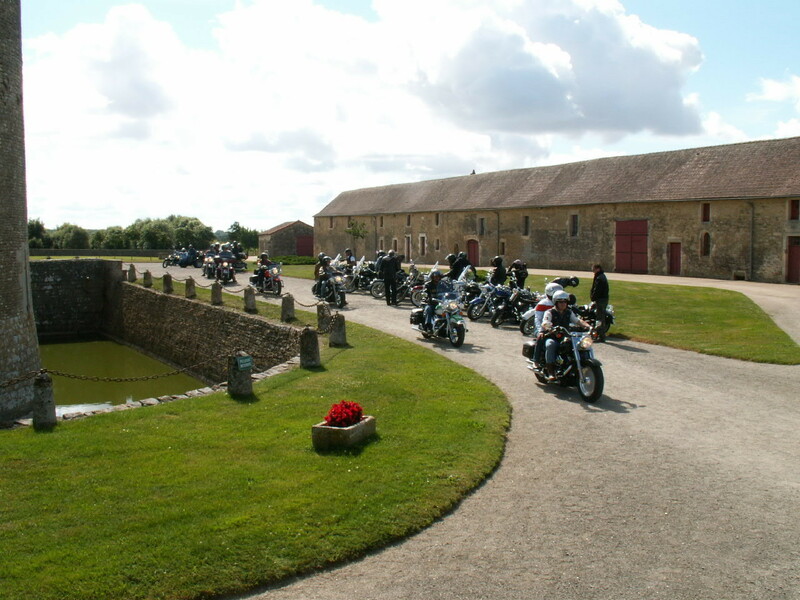 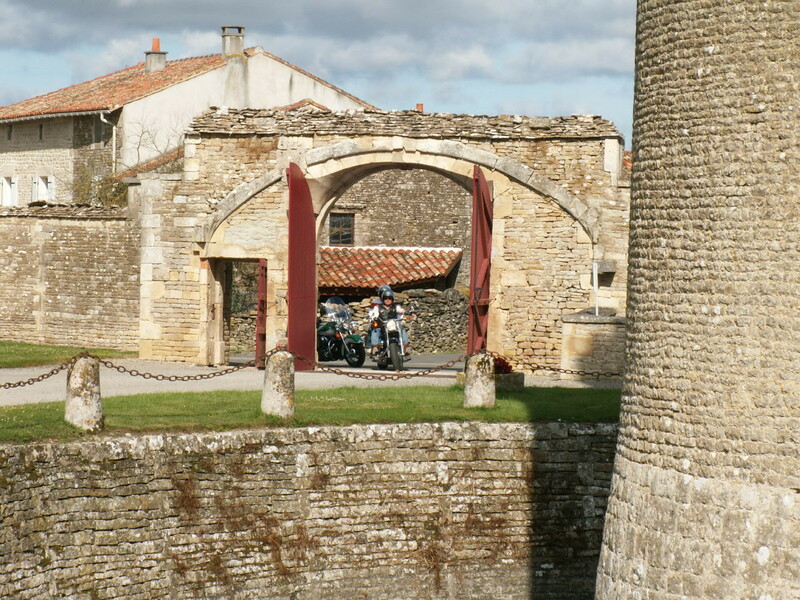 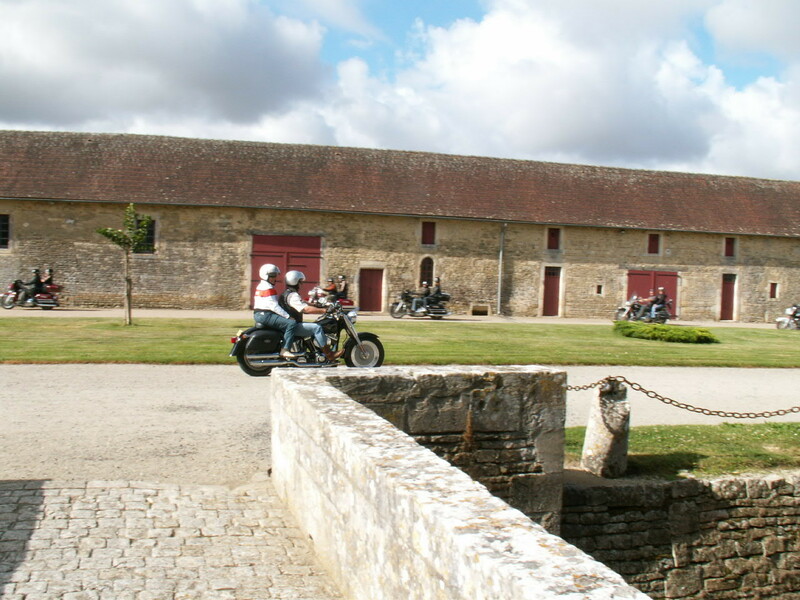 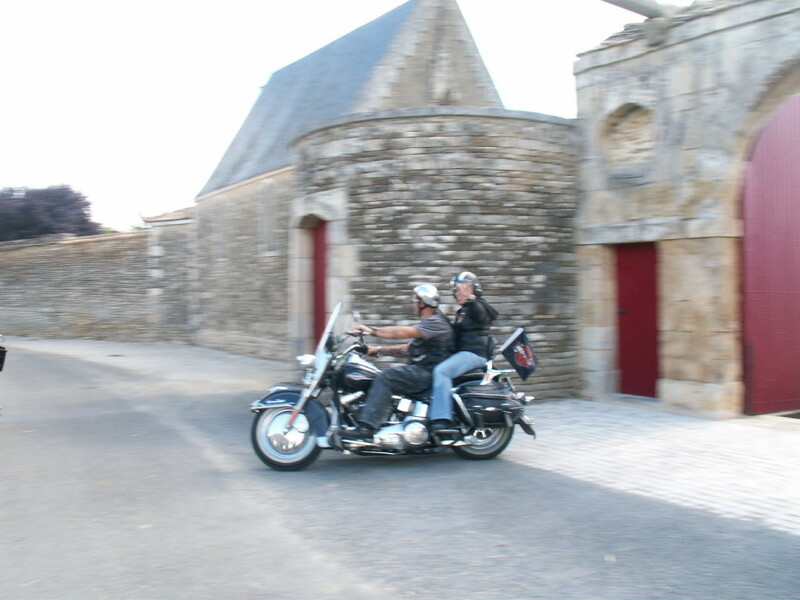 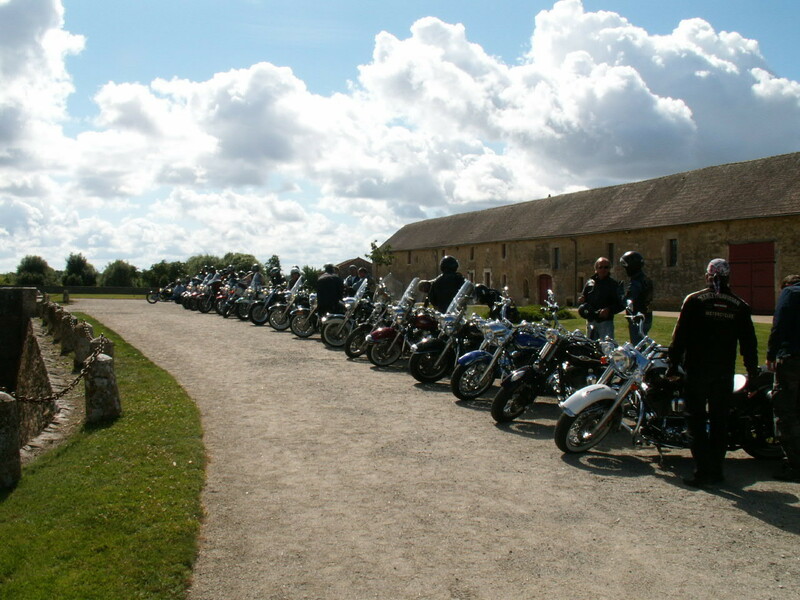 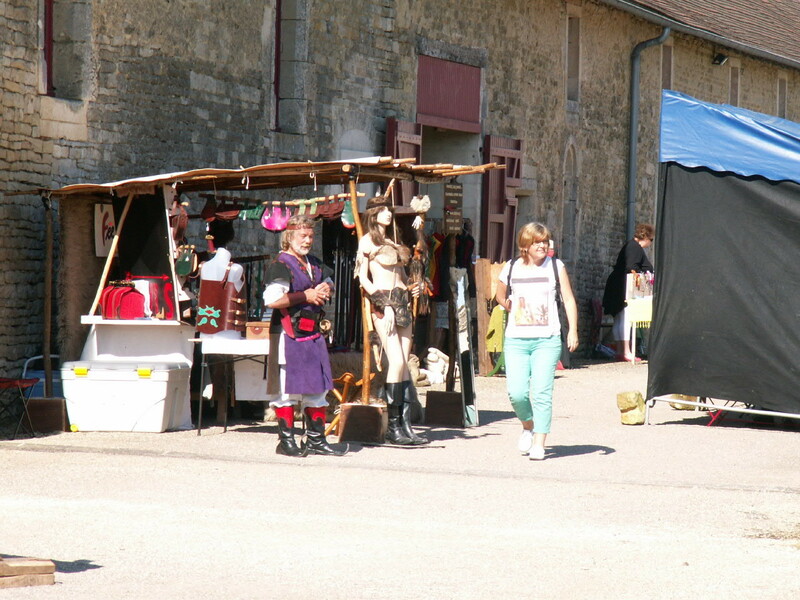 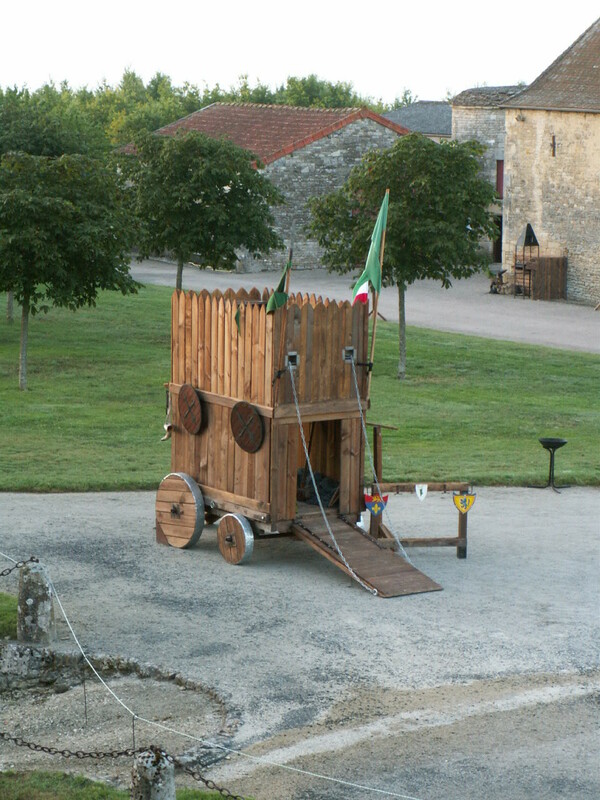 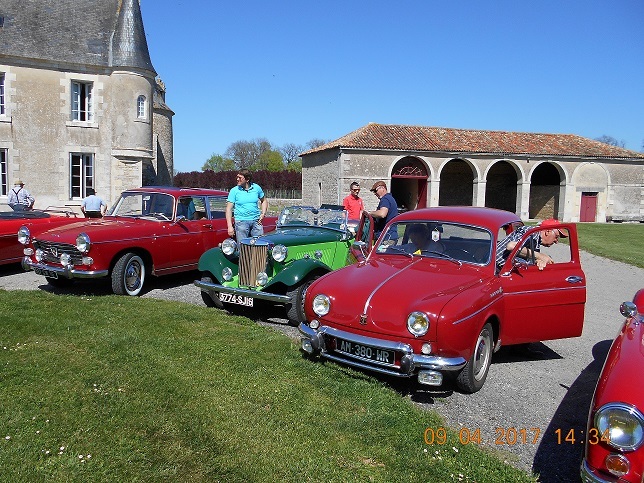 It attracts the inhabitants of the village, who melt of admiration, while the members of the Triumph Club of France Poitou-Charentes Region follow with attention and passion, the comments given by the owner of the place during the guided visit. 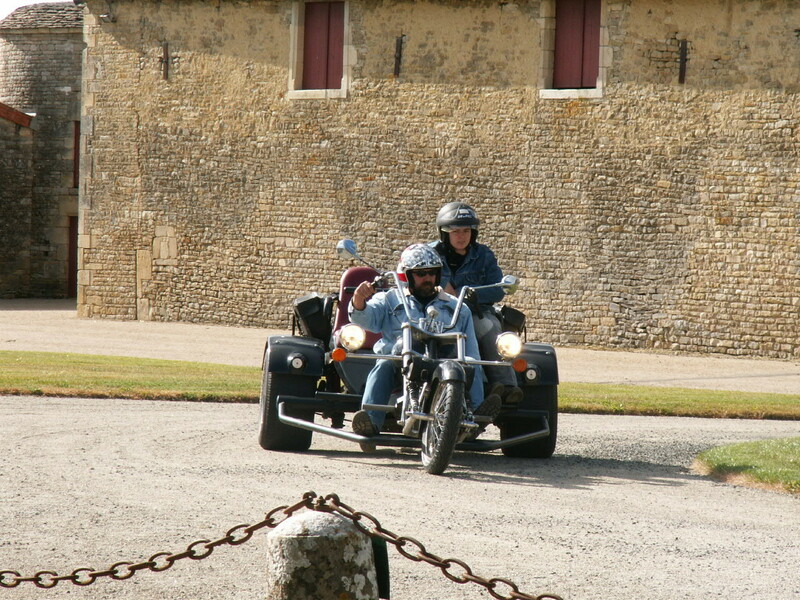 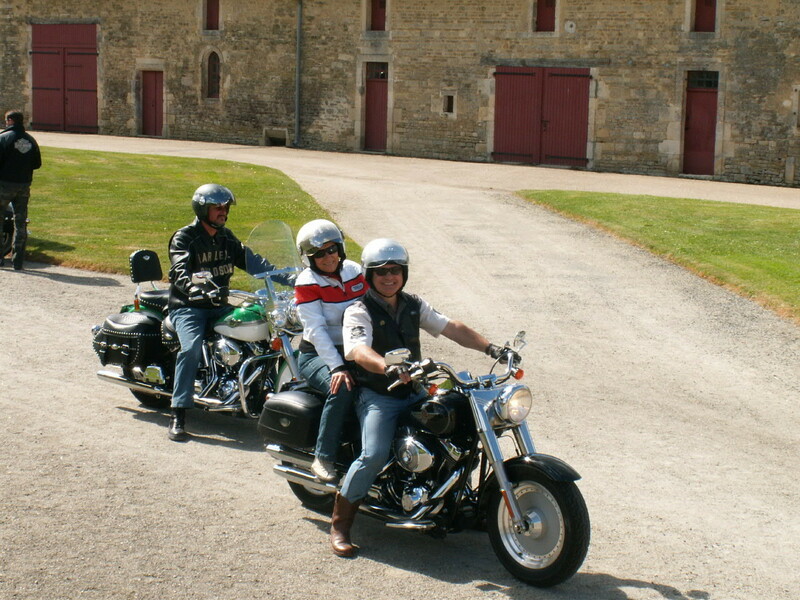 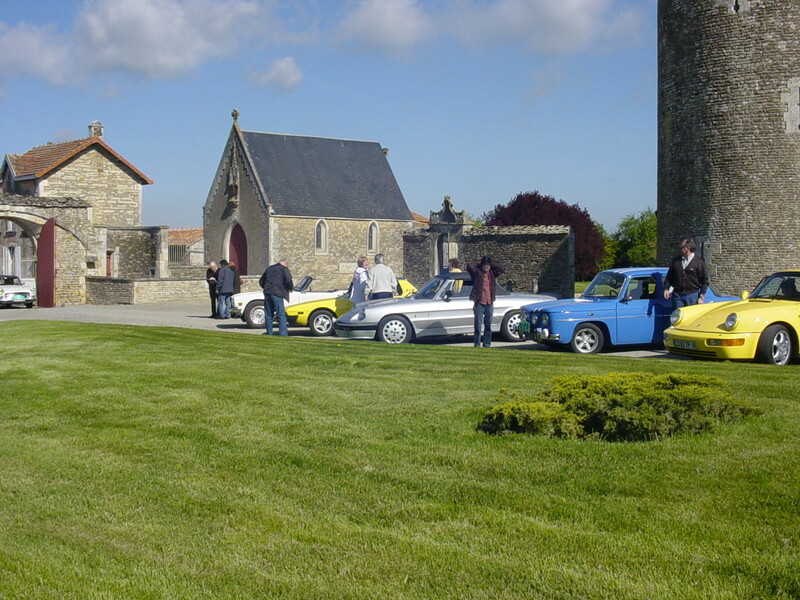 Driving at a normal speed of a convoy, on a very sunny day, the Club "Vieilles Roues Charentaises" came from Angoulême to the North of Charente. 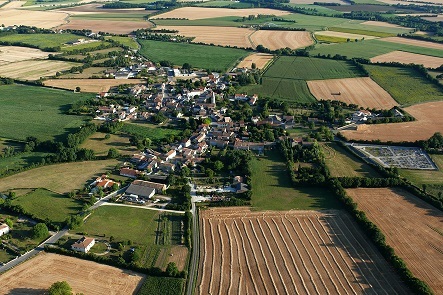 The choice of th edestination fell on the commune of Paizay-Naudouin, to be discovered by its members. 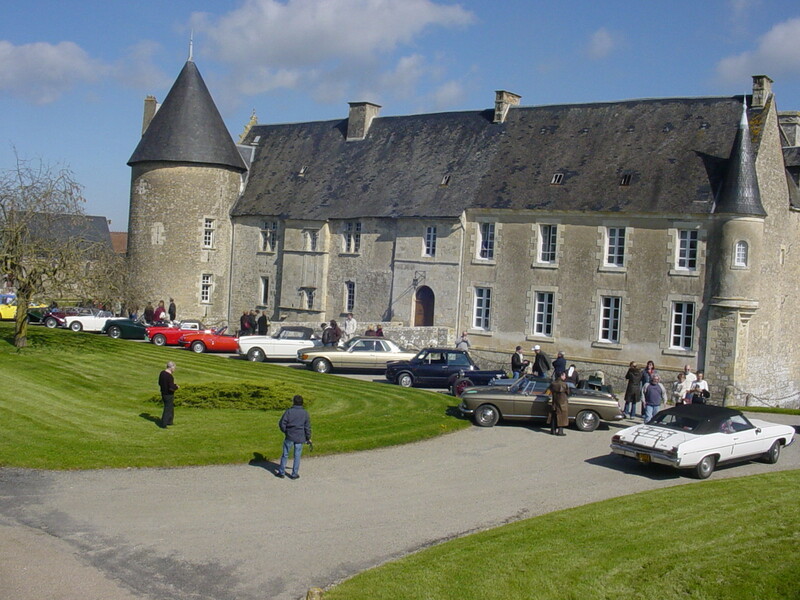 Several drivers showed their own car exposed around the central lawn facing the Chateau. 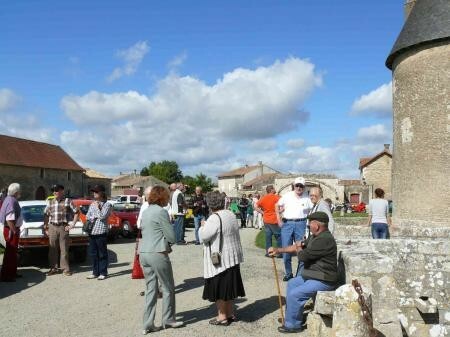 Some families of the village of Saveilles went to this demonstration at the same time colorful and noisy: horn, engine sound snoring like new in the crossing of the village of Saveilles. 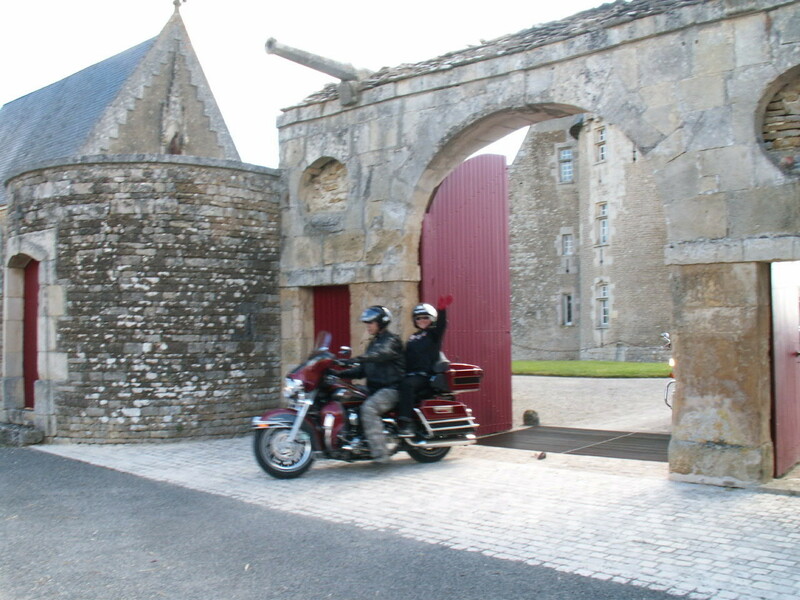 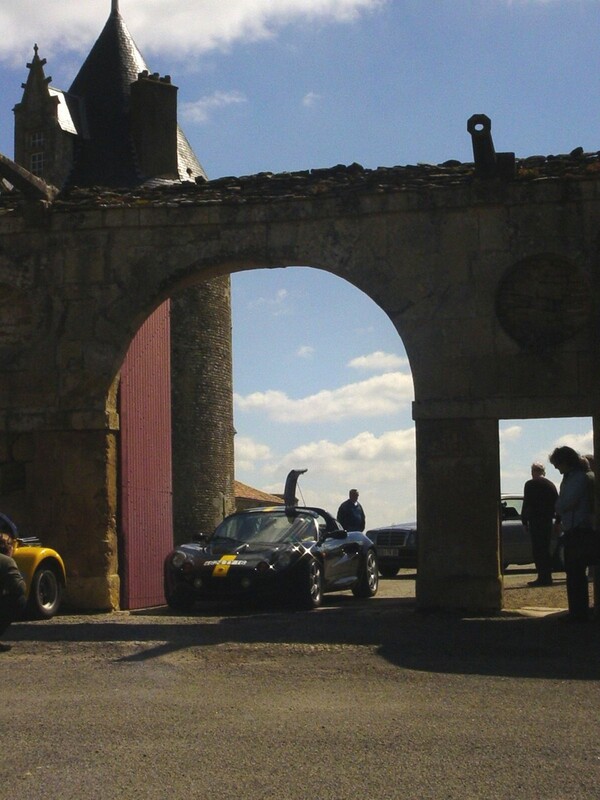 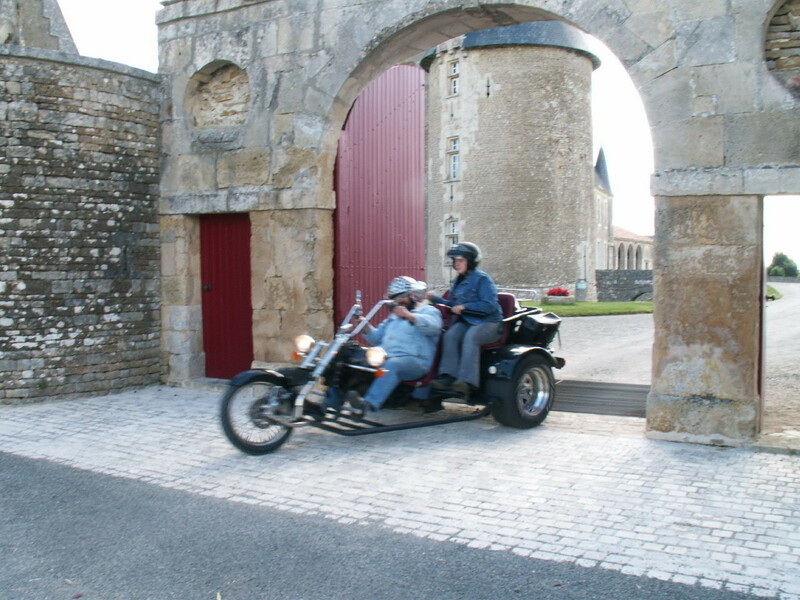 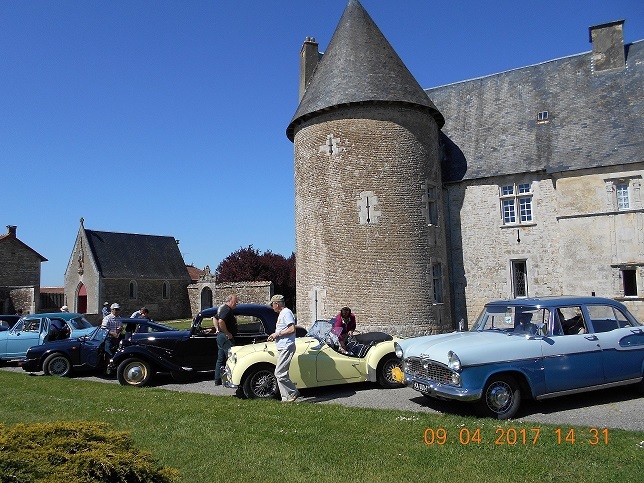 A guided tour by th owner of the exteriors of the Chateau and its chapel followed, keeping the curiosity and the sustained and participative attention of the passengers of the vehicles and their drivers. 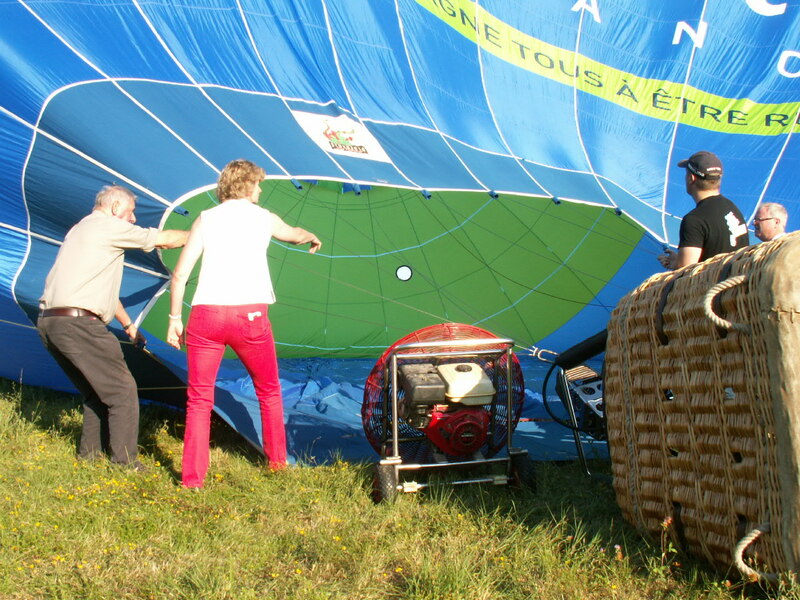 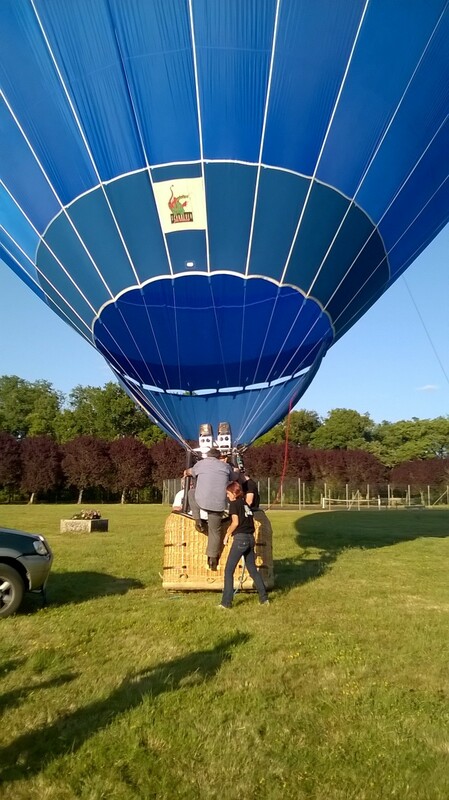 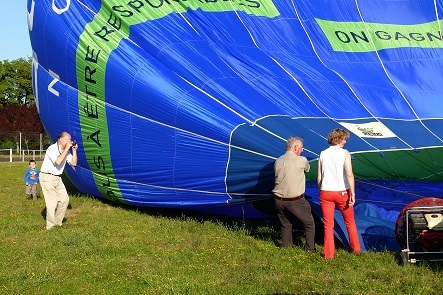 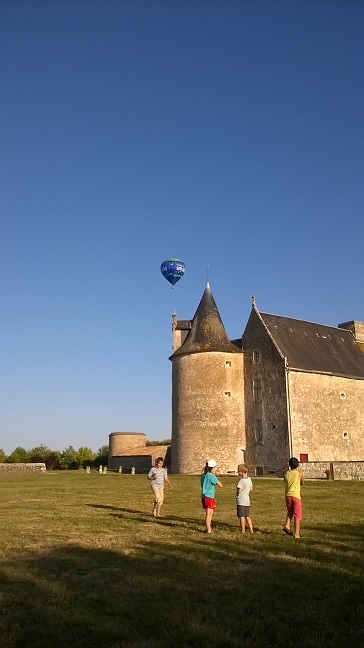 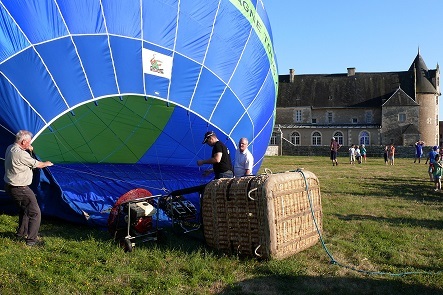 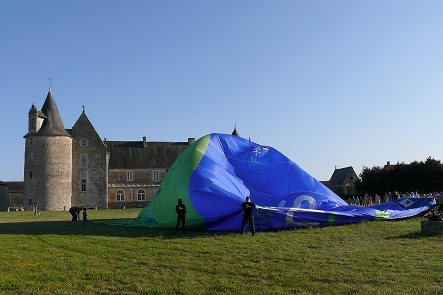 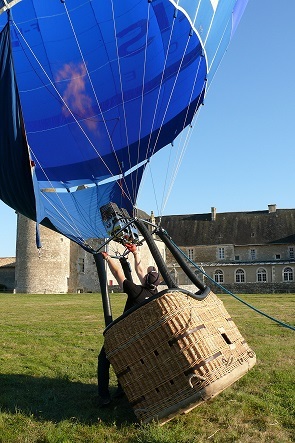 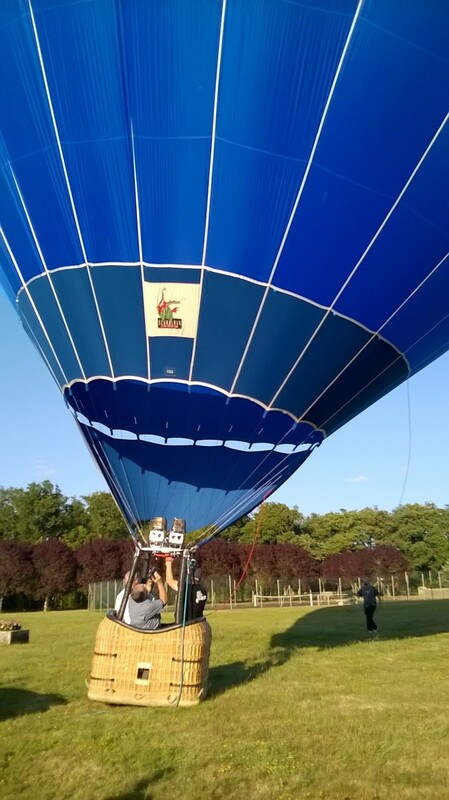 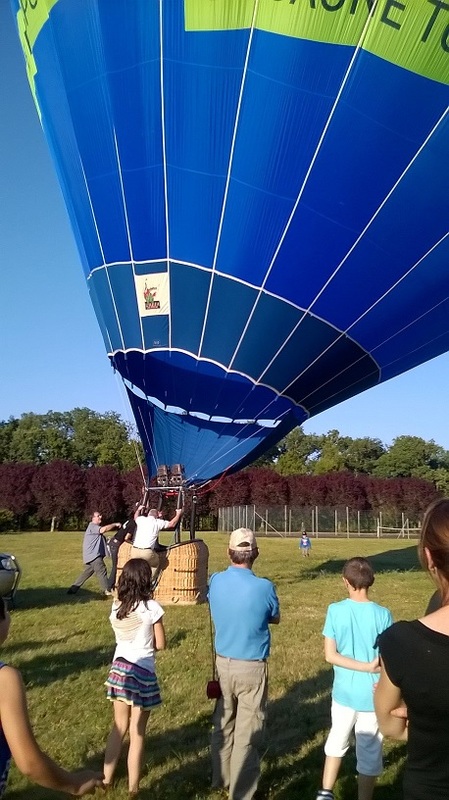 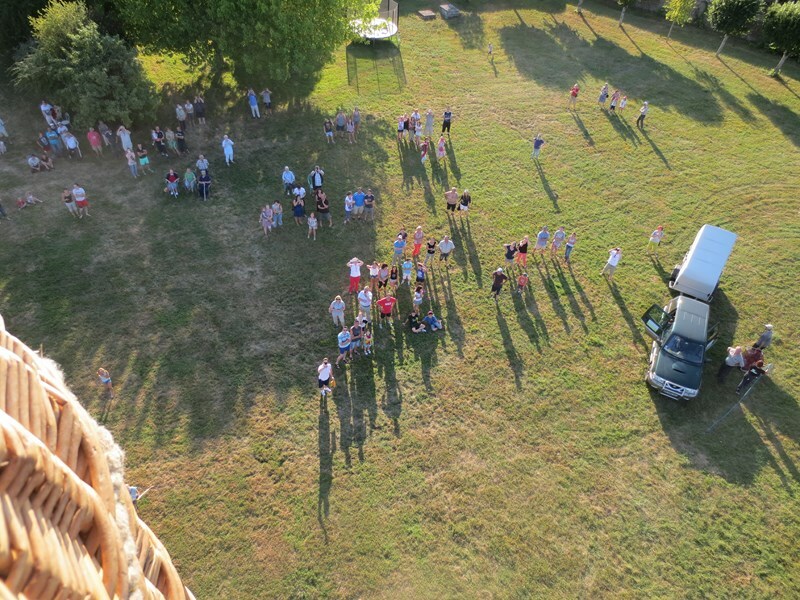 In front of an excited audience of 100 watching the preparations for take off, the Association Mongolfières Charentaises, based in Angoulême, carried out its inaugural flight from the Chateau park under clear skies and a gentle North North-East breeze. 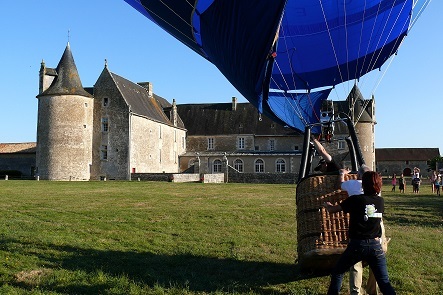 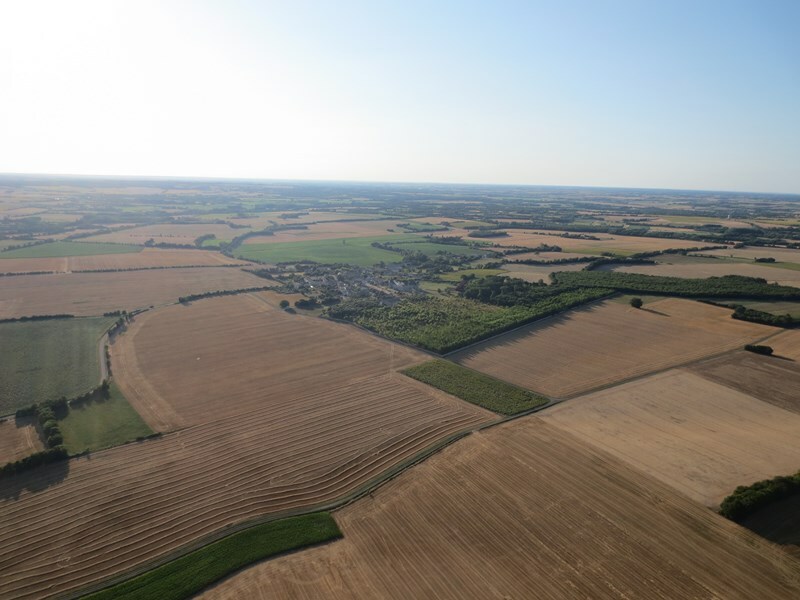 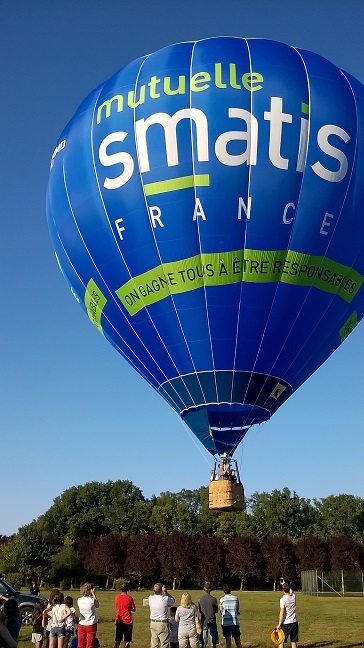 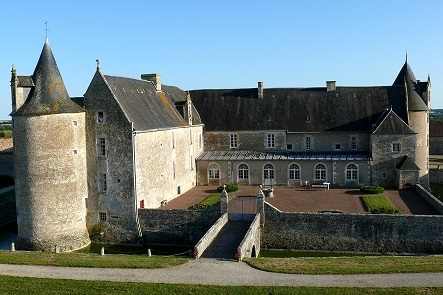 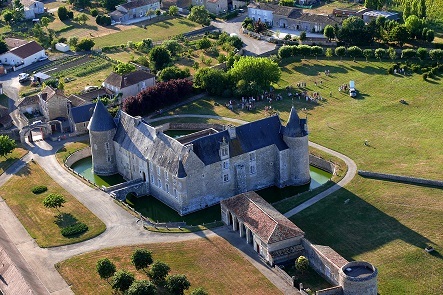 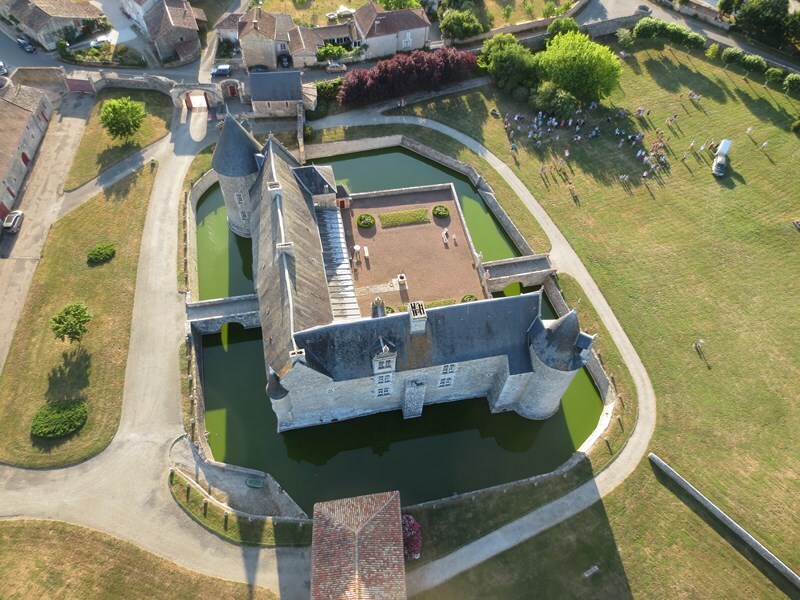 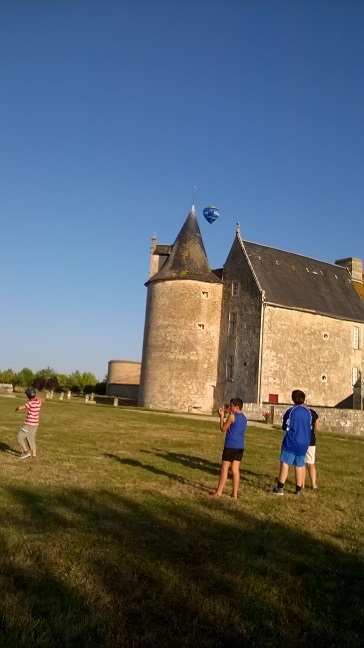 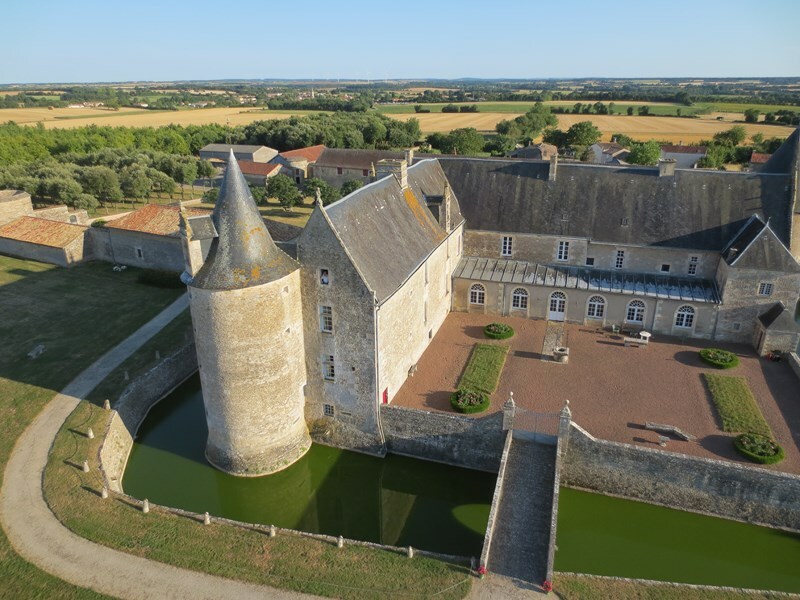 Boarded by the pilot, Manuel Drouaud and two passengers, float away and at comfortable height view the Chateau from the air, a soft landing in stubble, several kilometers later in the Charente countryside. 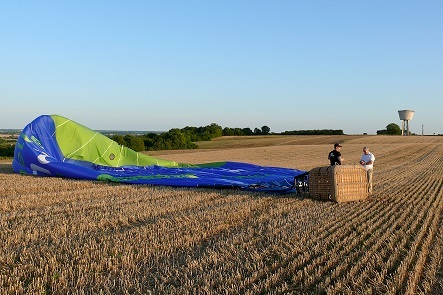 The ground team are there on landing. 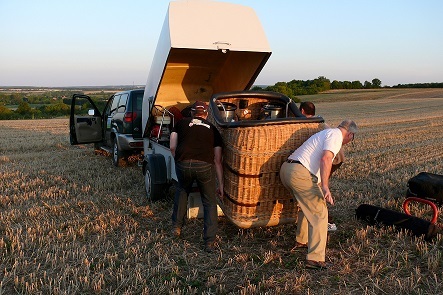 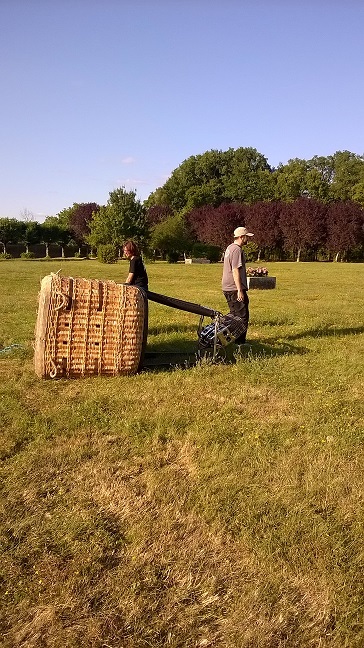 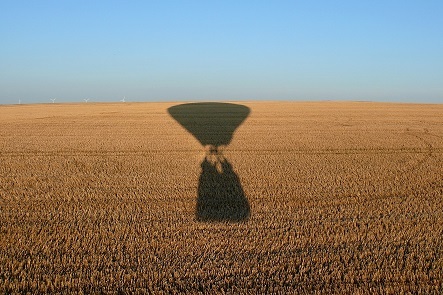 In a trice passengers and crew detach the basket and carefully fold the fabric of the balloon for the next flight from either here or elsewhere. 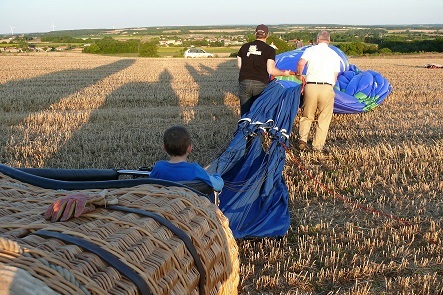 Back to base for a well-deserved snack after experiencing the unforgettable pleasure of a first balloon flight and the magnificent sunset. 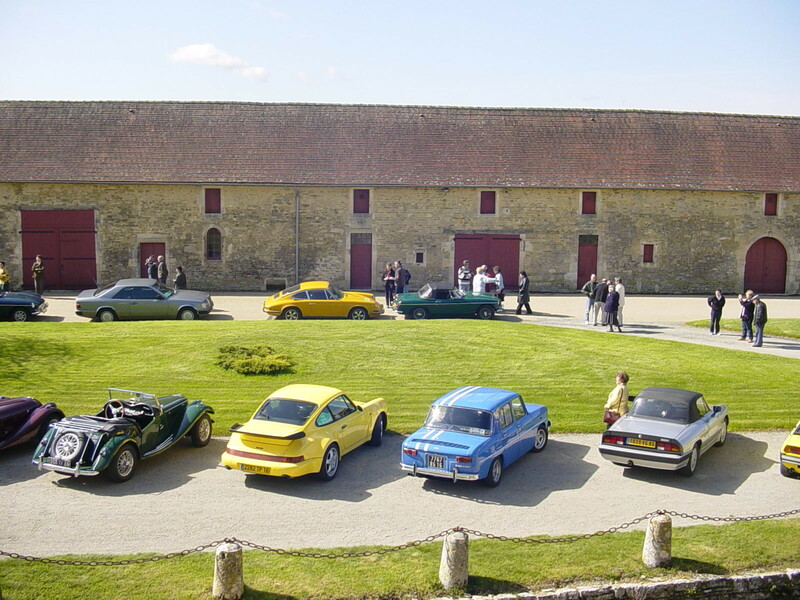 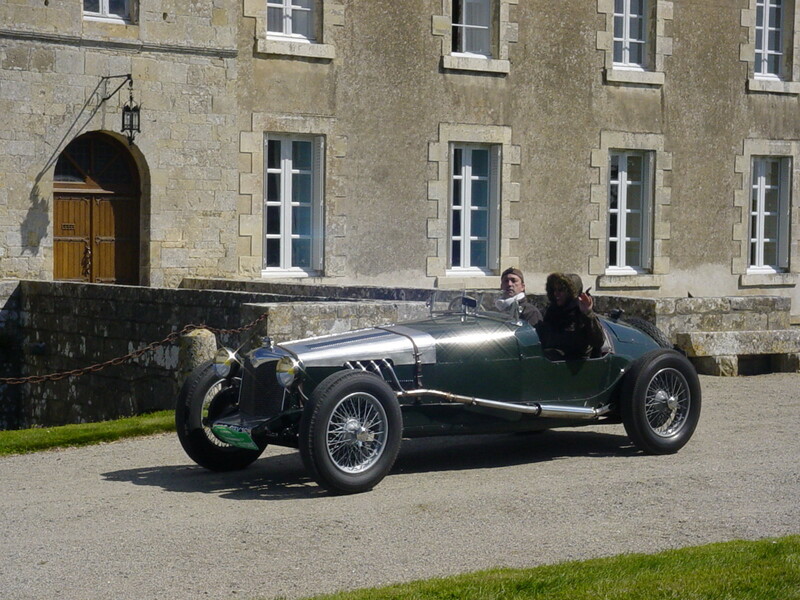 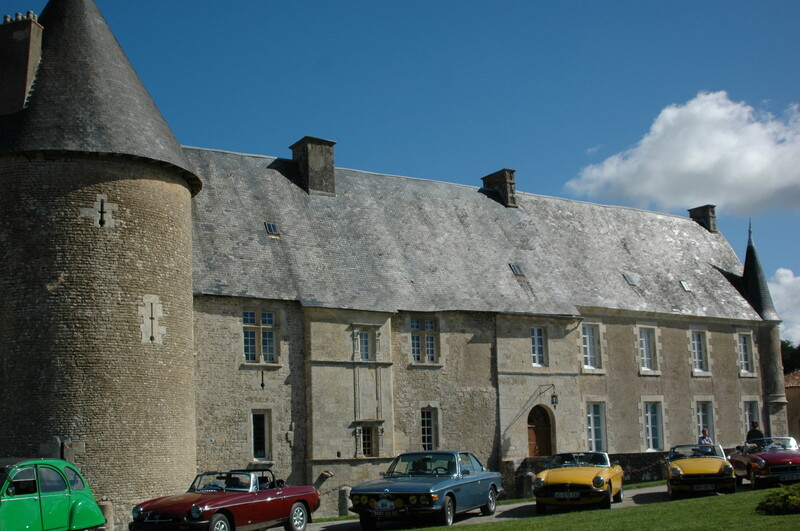 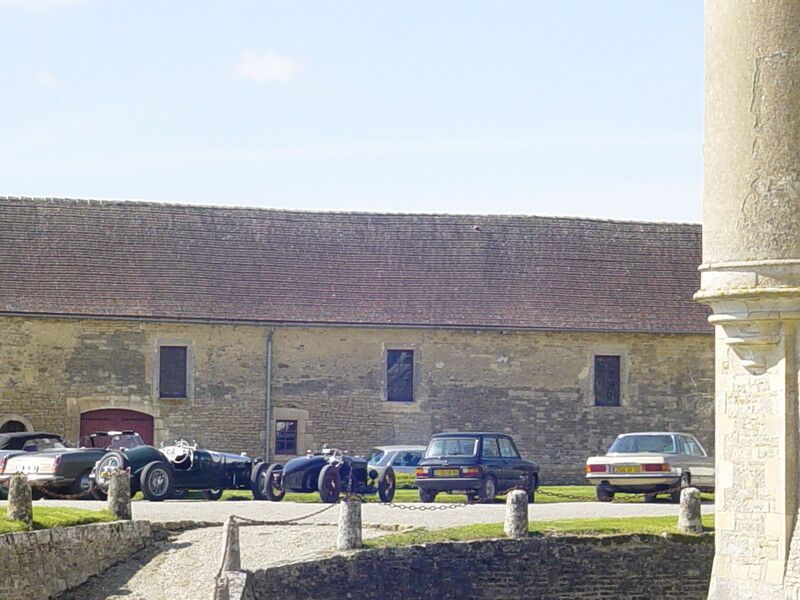 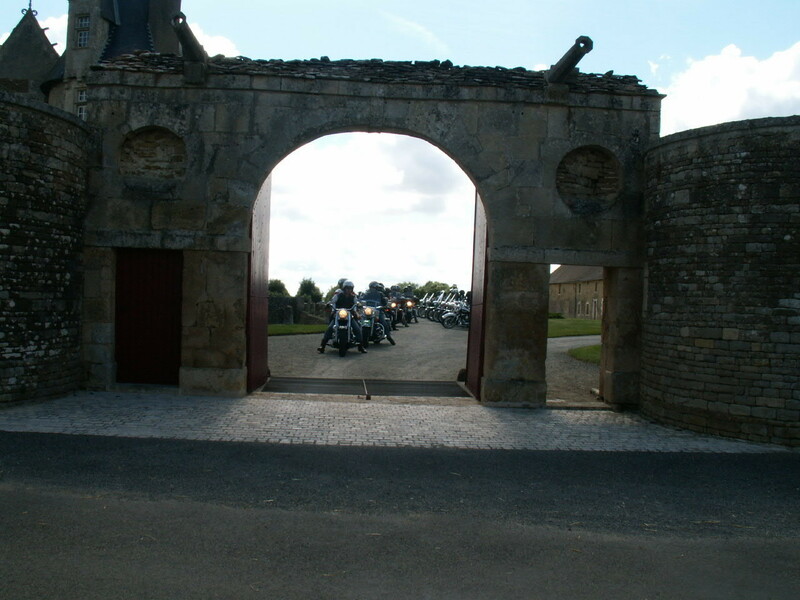 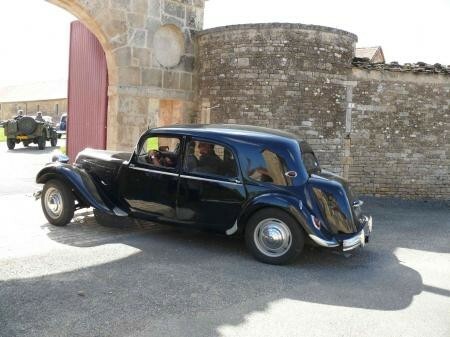 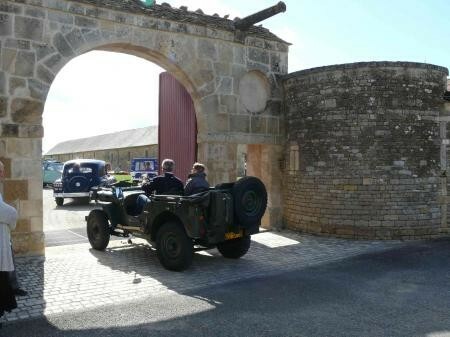 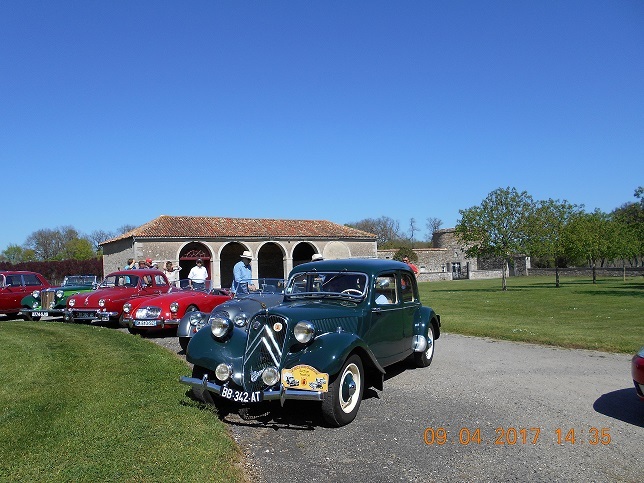 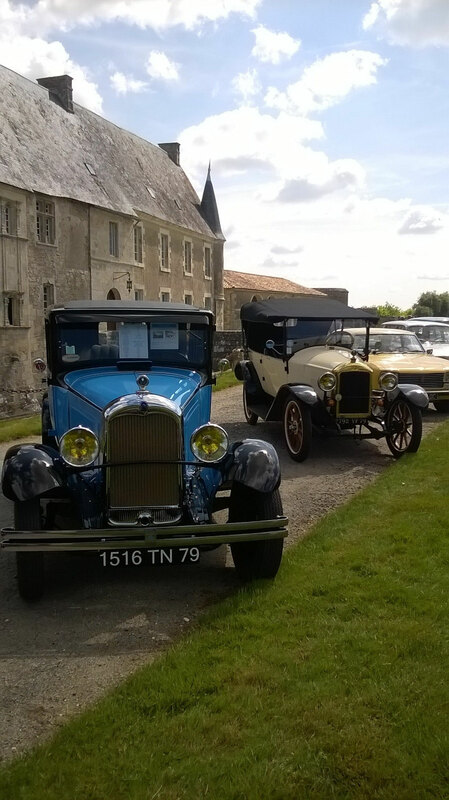 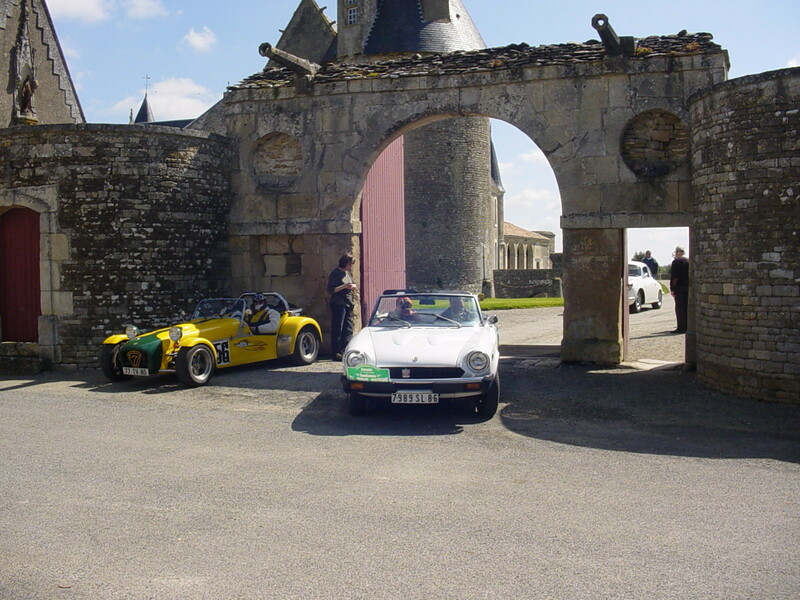 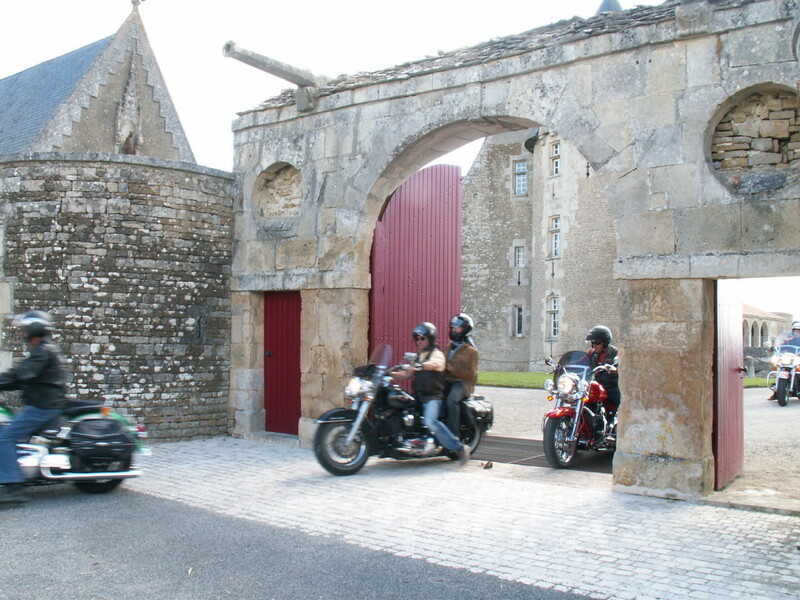 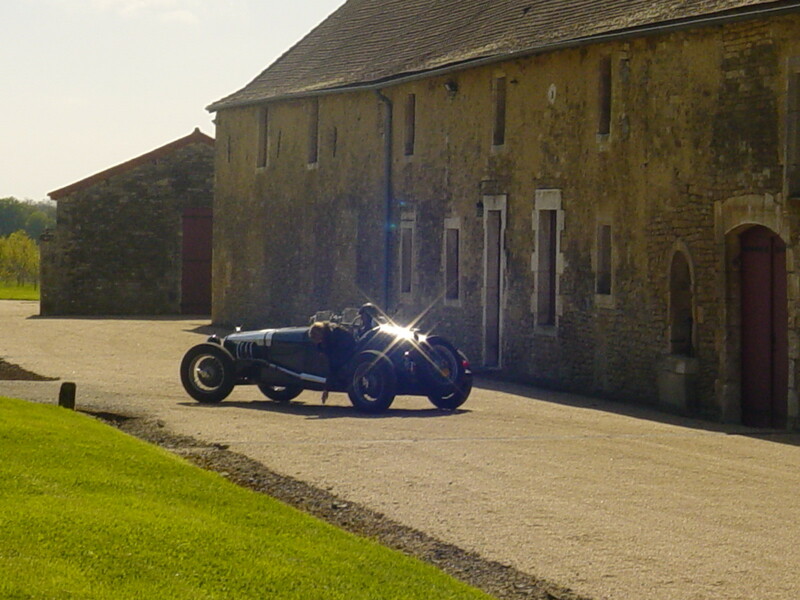 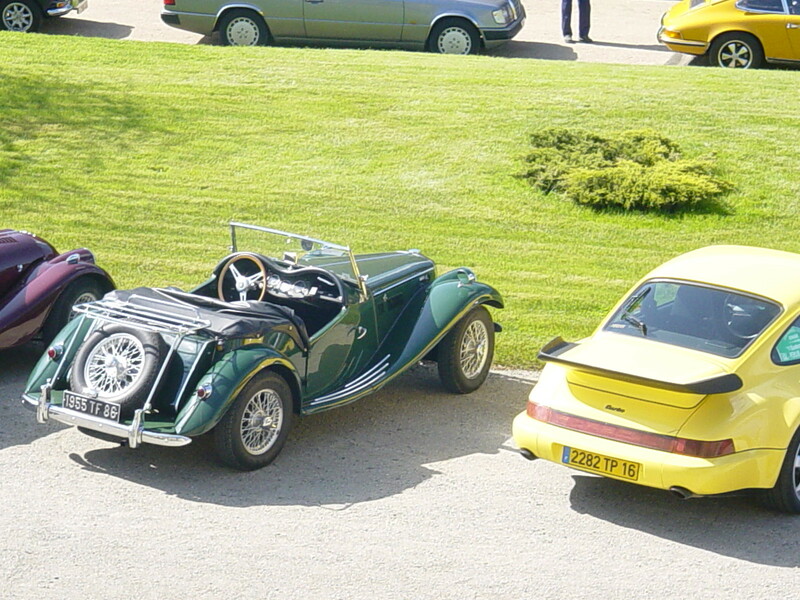 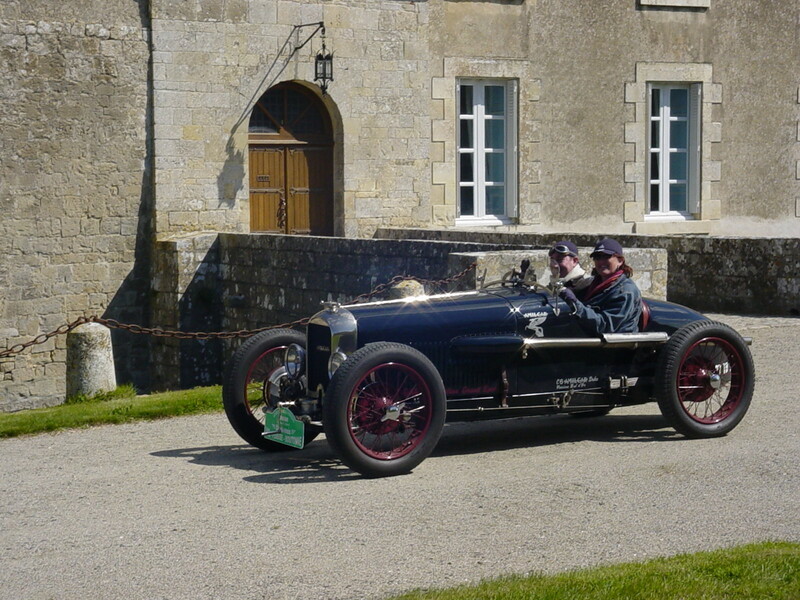 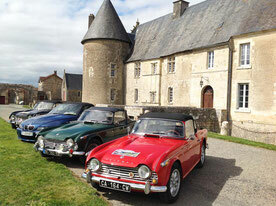 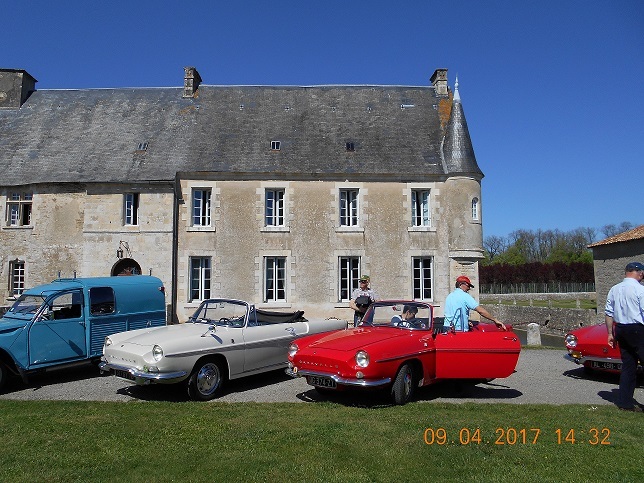 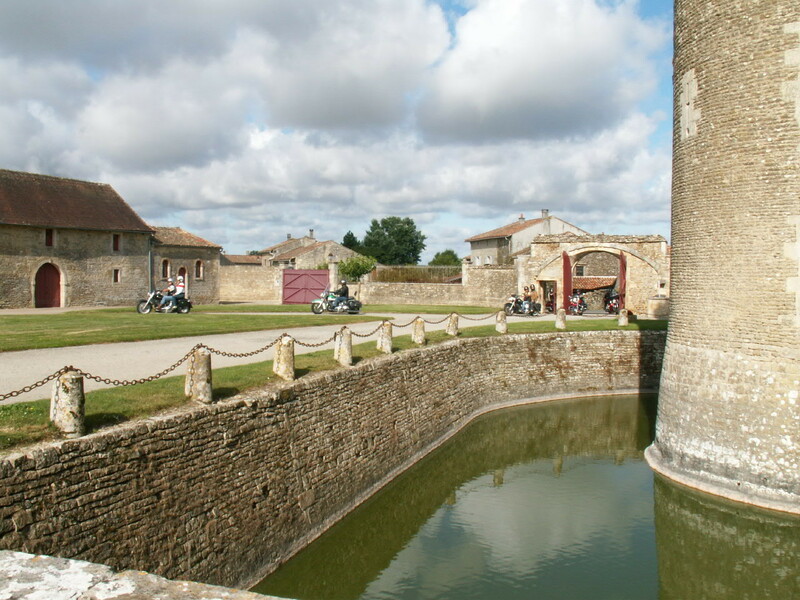 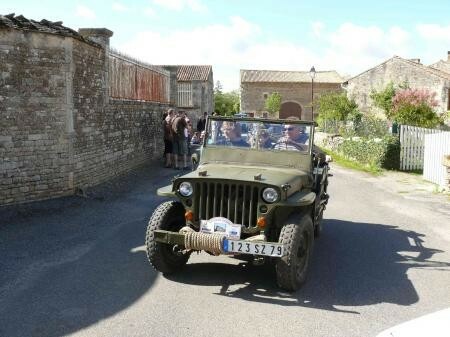 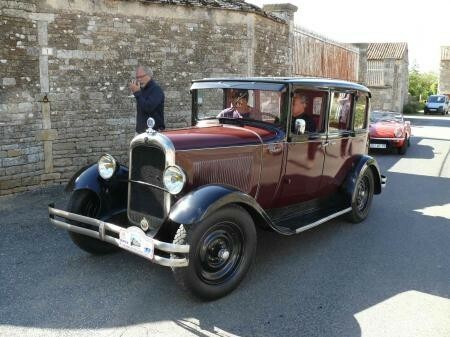 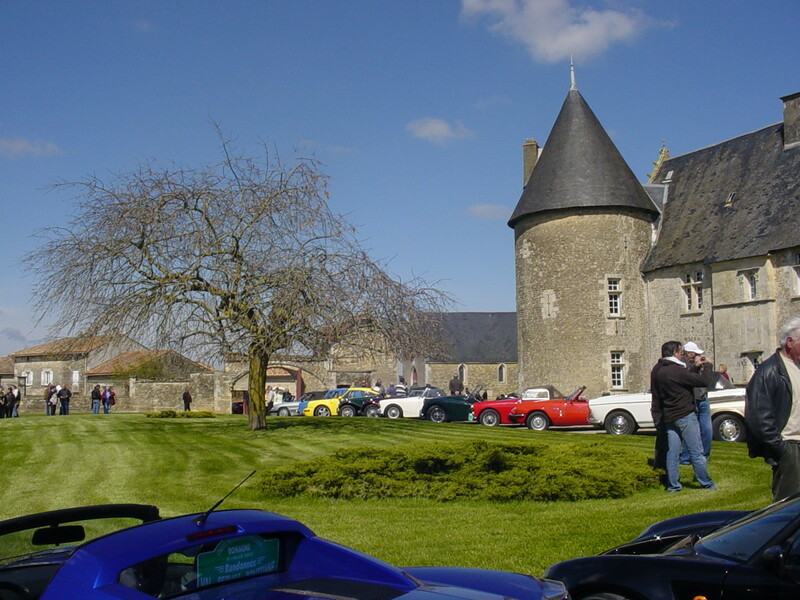 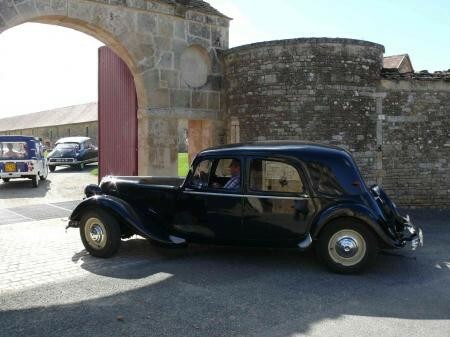 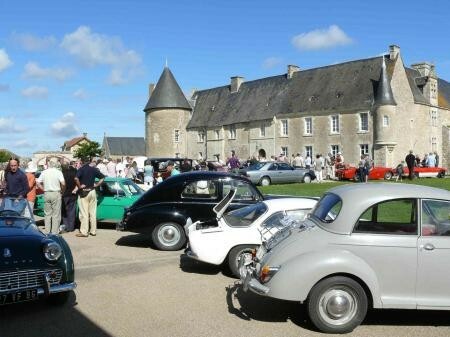 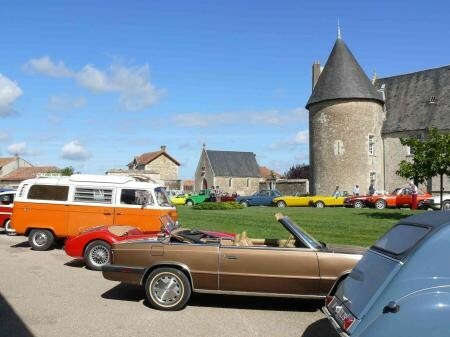 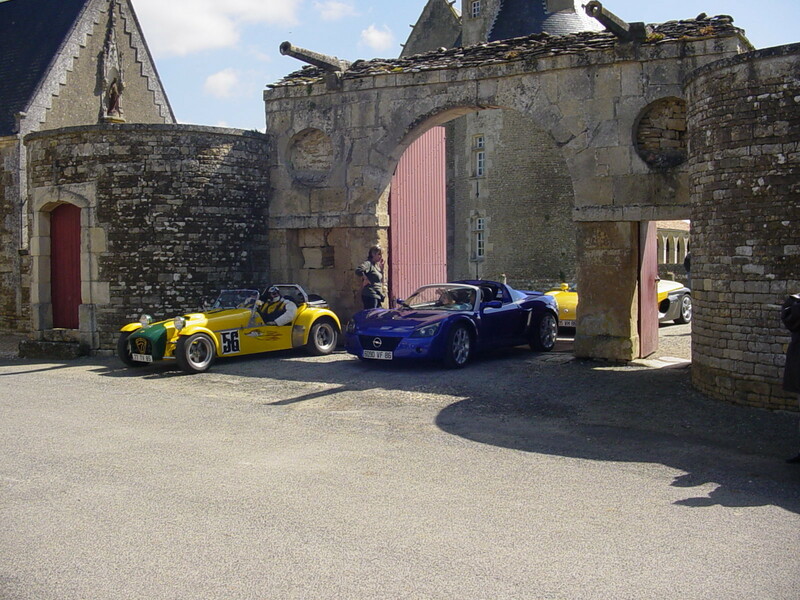 Sunday June 21st, on a sunny morning, the Association of Vintage Cars and Motorcycles Deux-Sèvres (3AM), based in Celles sur Belle (79) makes a stop at the Chateau de Saveilles. 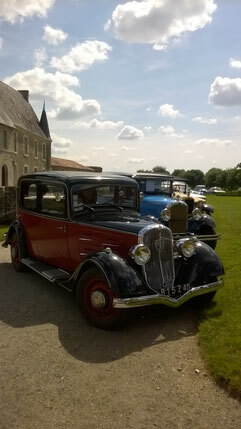 Forty old vehicles of all types, from the 1920s to the 1990s. 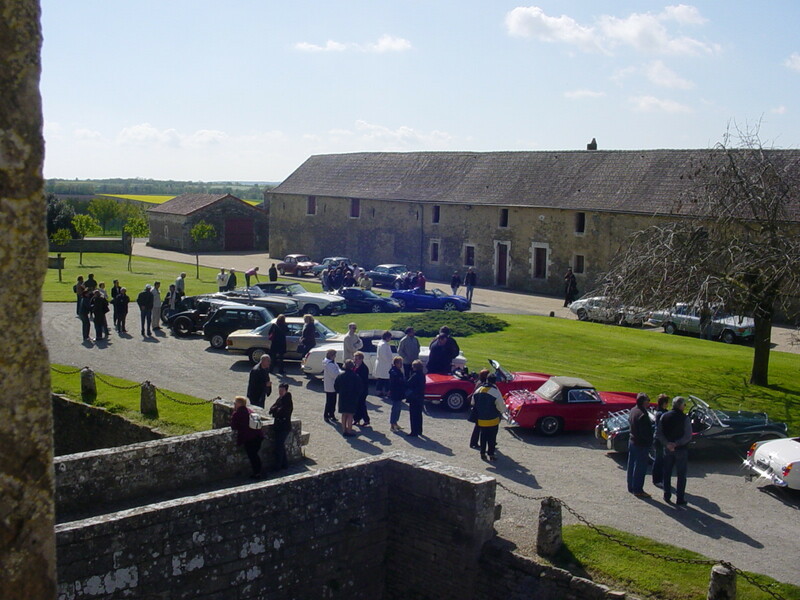 Youthful memories for spectators, passion for the participants! 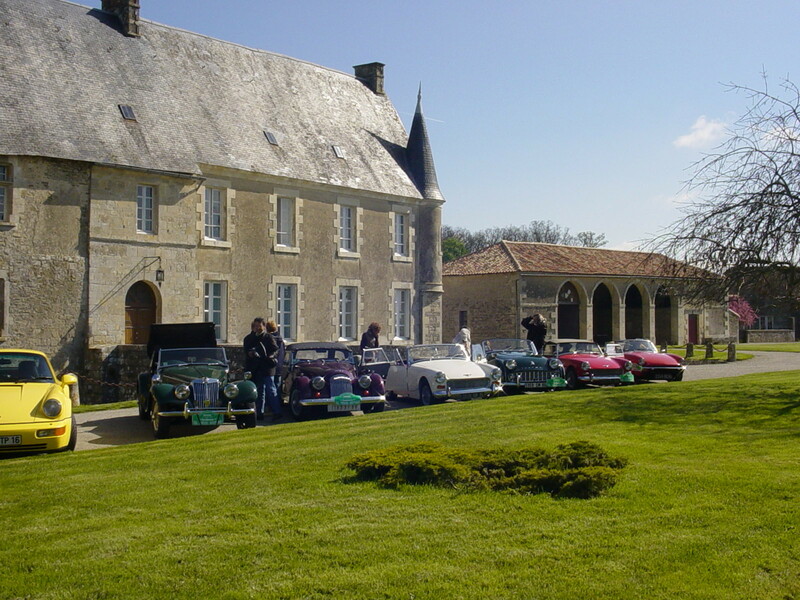 A group of drivers and passengers listen carefully and participate during the guided tour of the history and architecture of the Chateau. 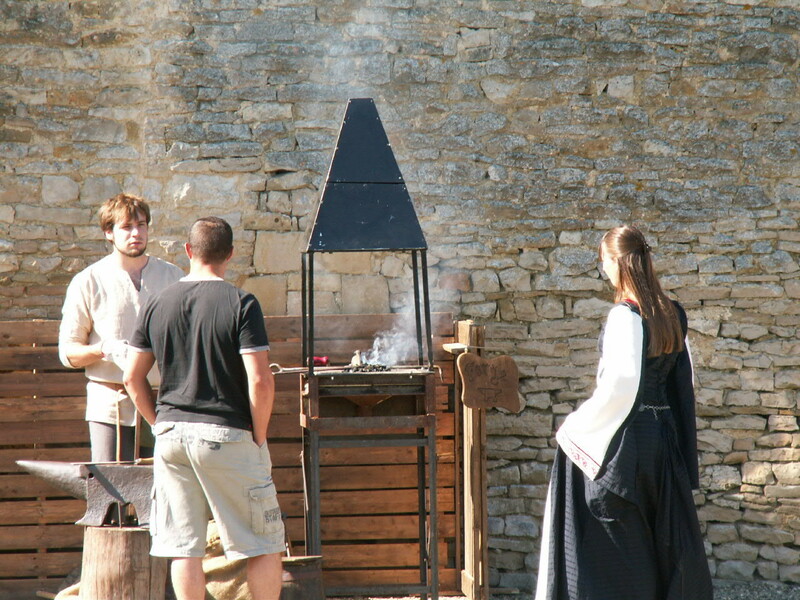 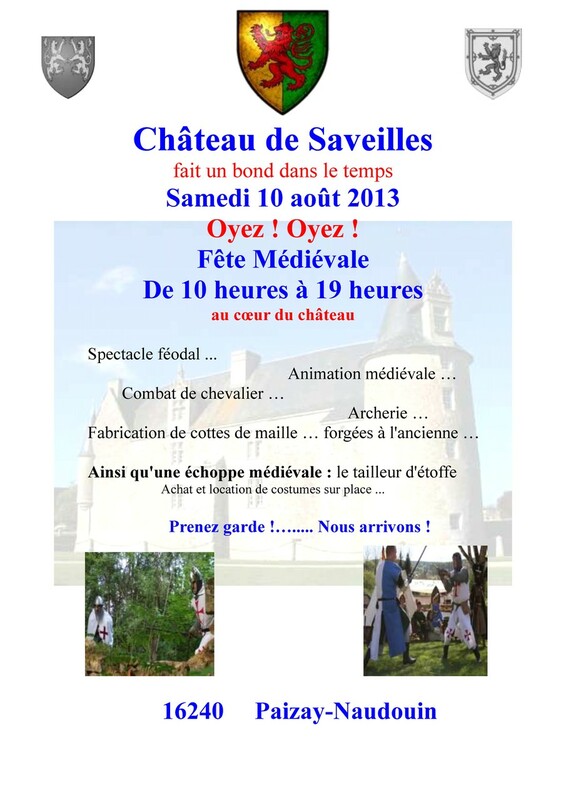 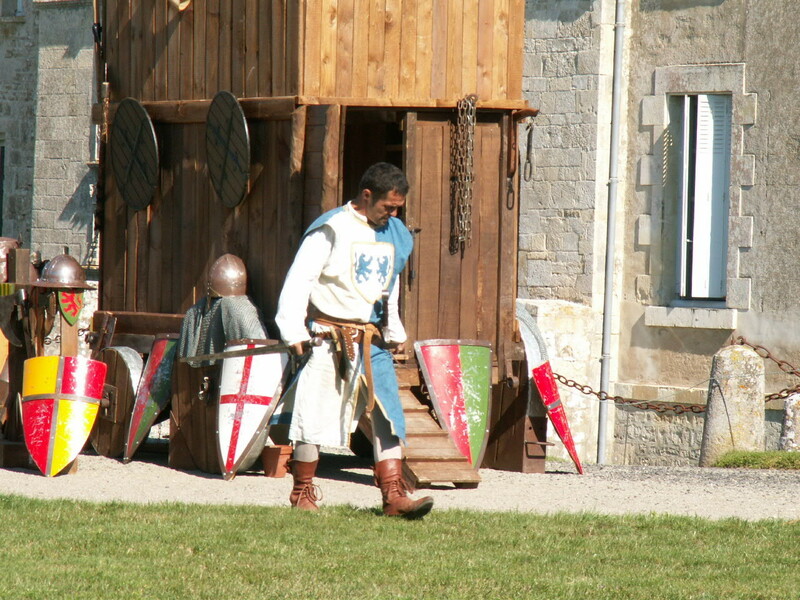 During Heritage Days, getting to know fossils and minerals of the Paleolithic and Prehistory, also old stones and history of the Chateau de Saveilles. 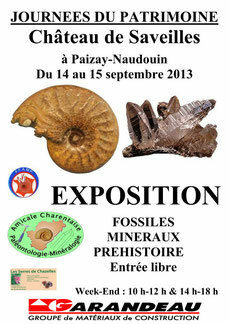 A chance to present to the locals and those from elsewhere an impressive collection of fossils and minerals thanks to local resident Mr. Yves Chauvigné and his long time passion. Indeed going back to his childhood and school years under the leadership of Mr. Desouche, his teacher. 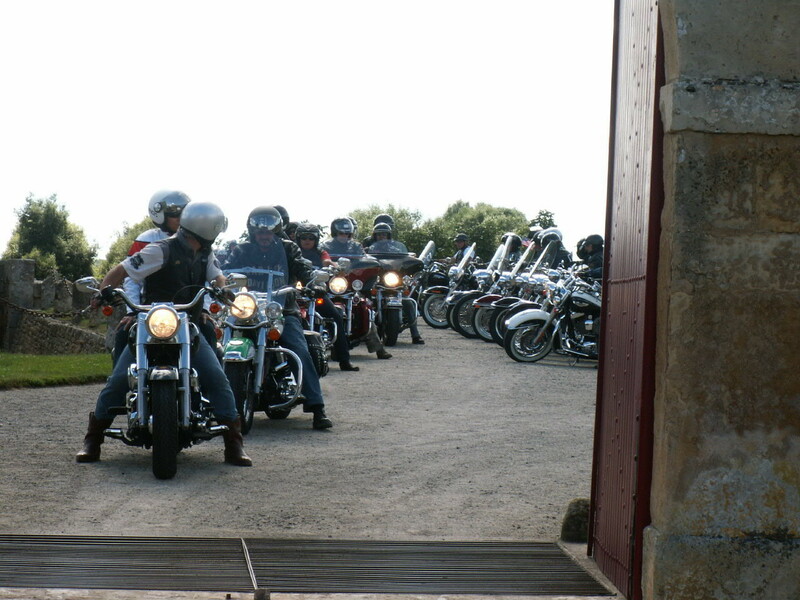 A passion that has never gone away. 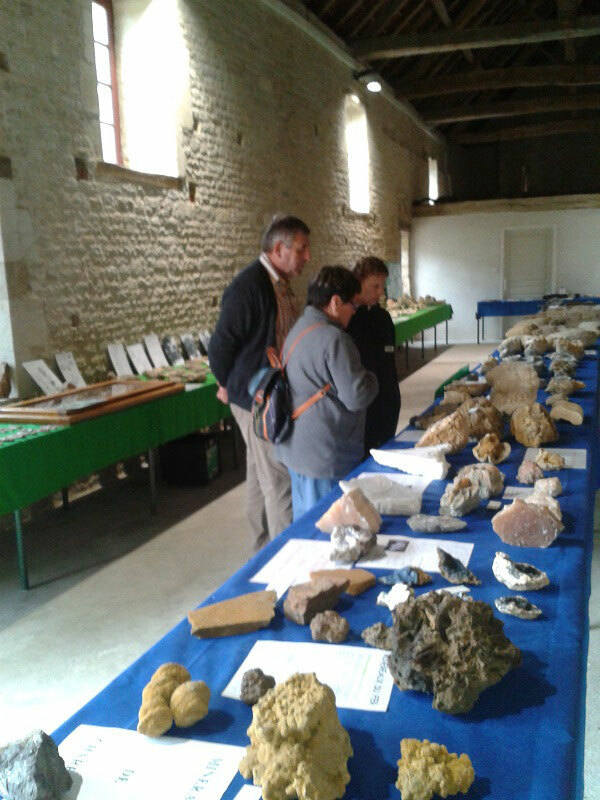 The Amicale Charentaise de Paleontologie and Mineralogie (CMPA) of which Mr. Chauvigné is a member, showed almost a thousand beautiful examples (only a portion of the whole collection!). French fossils and minerals (inc Charente), prehistoric flints from Charente and fossils unearthed during the construction of a new TGV line in the area. 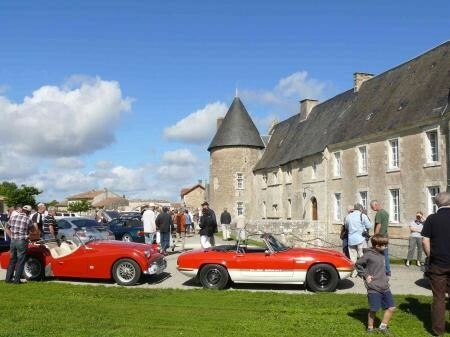 Many people of all ages were able to discover the old stones and history of the Chateau presented by the lord of the manor and at the same time the wonders of the ACPM exhibition presented by members of the association and Mr. Yves Chauvigné. 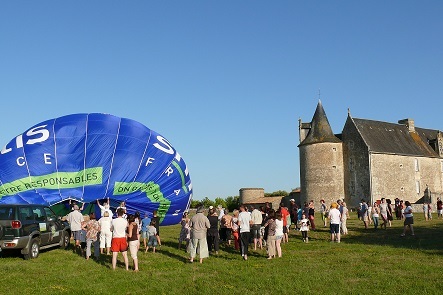 Appreciated by all the visitors including some tourists from New Zealand. 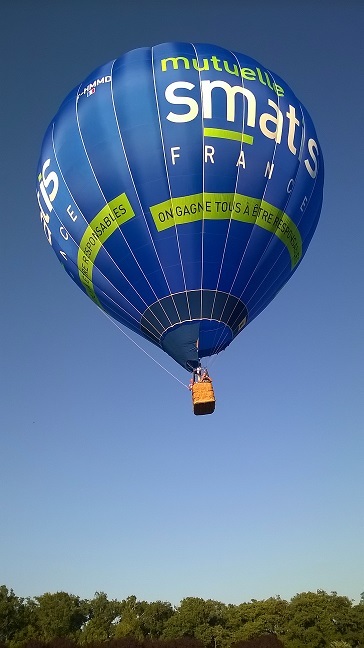 Apart from the pronounciation it was pleasing to discover that in science, there are many similarities between French and English! 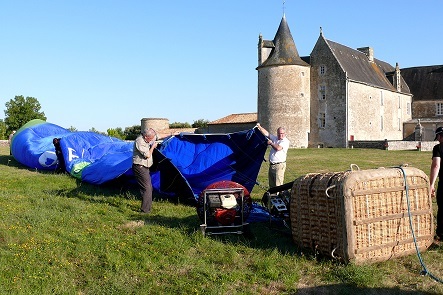 A great first for the Chateau de Saveilles with this leap in time. 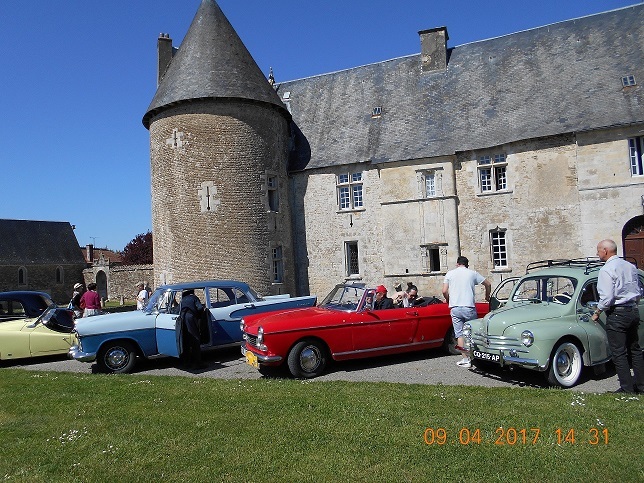 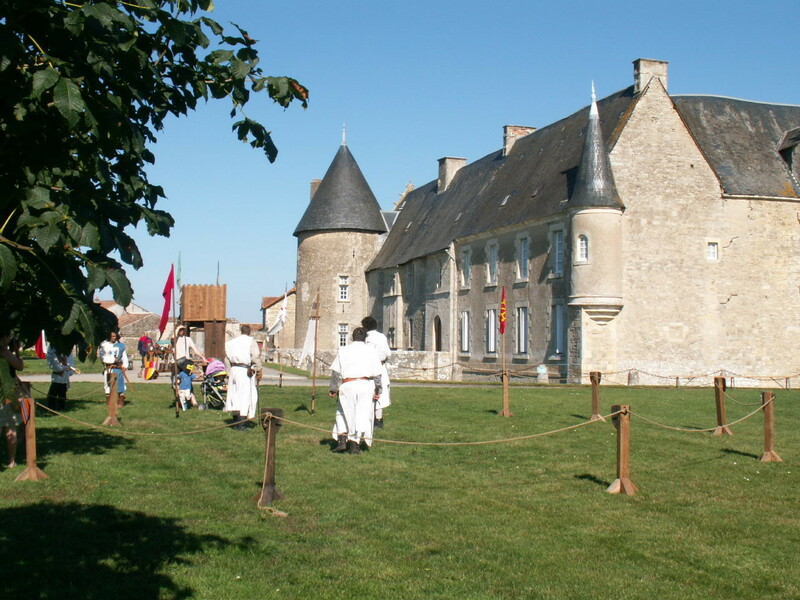 Bringing together nearly 600 people from 2 to 90, a family day at the Chateau with lots of activities in the courtyard and outbuilding. 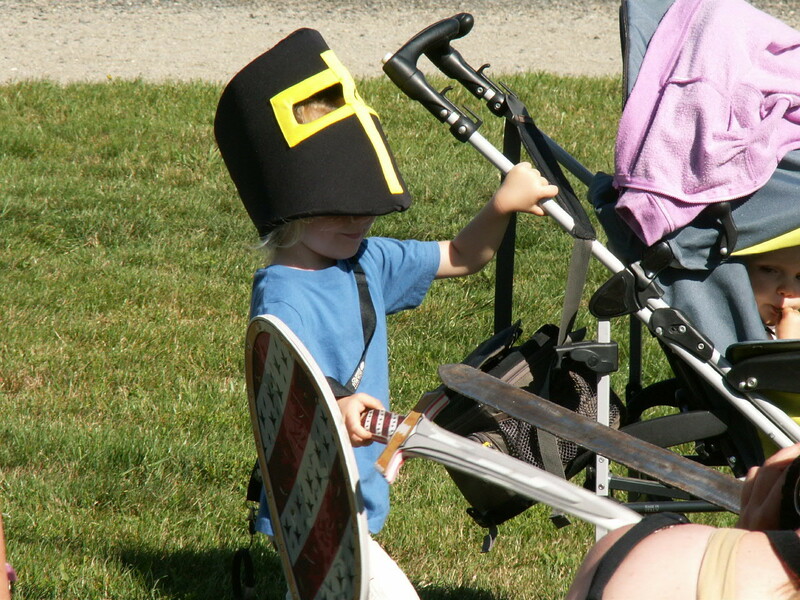 A great battle between knights took place mid-afternoon. 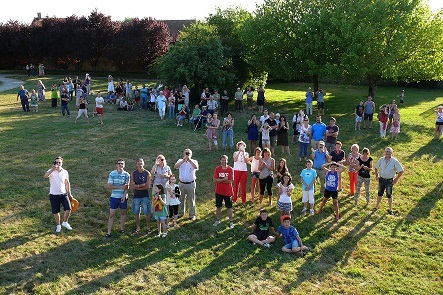 The commune events committee and local volunteers along with the Occitania group worked together to put on a good show. 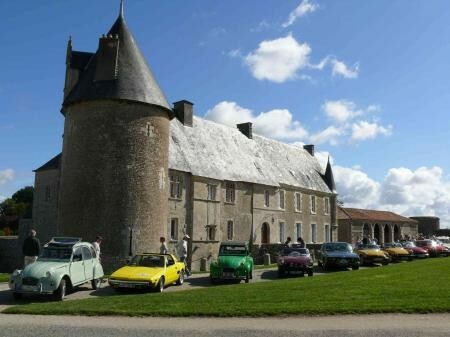 "All visitors were pleasantly surprised by the charm and size of the chateau." 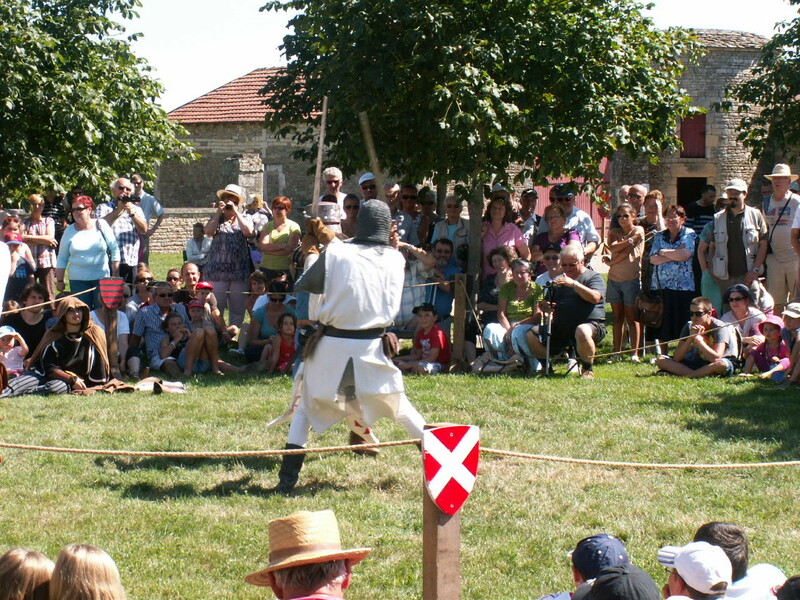 says the blog de Villefagnan. 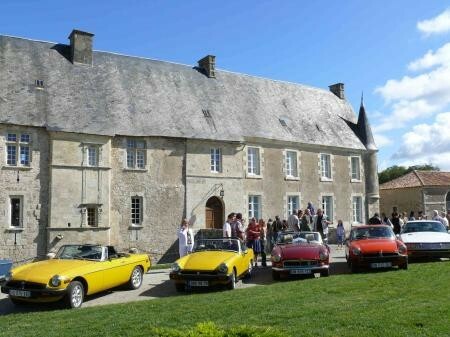 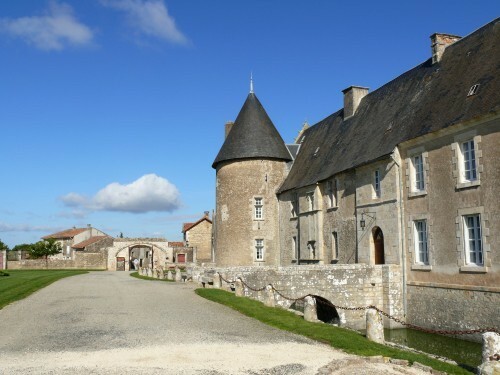 "... Aizecq," Wood and Stone, " guided trip to the village, its houses, its lofts, its small dry-stone huts and visits to two artisans who work with wood, July 27th, guided tour of the Chateau de Saveilles, Paizay-Naudouin, exceptionally led by the owners, followed by a guided tour of the Gallo-Roman site at Embourie and the space dedicated to its Roman villa, August 3rd, Bioussac, guided walk of the village, church, lavoir, traditional rural buildings, bread oven, etc ... "
On the occasion of the 20th anniversary of the association, adapted choreographic representation of "The twelve Labors of Hercules" in connection with the mythological subjects that adorn the chateau de Saveilles and Marshal Turenne, converted to Catholicism by Bossuet. 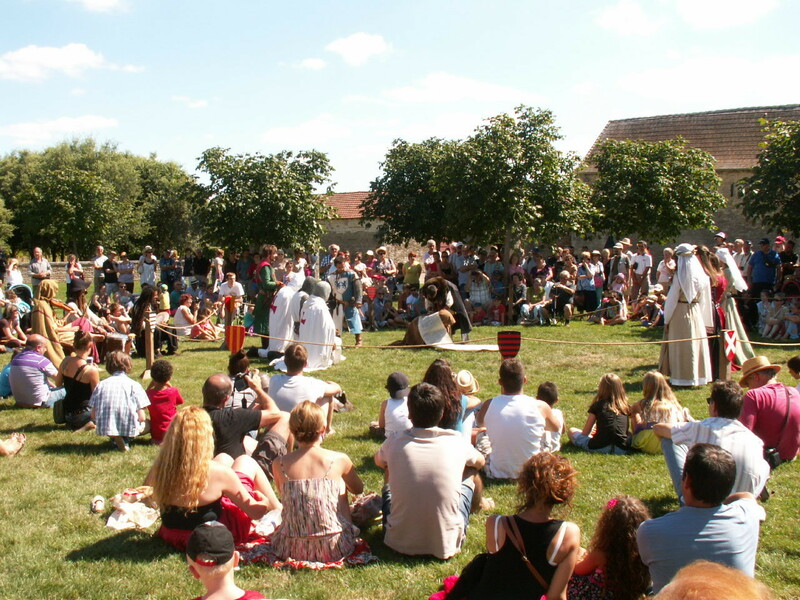 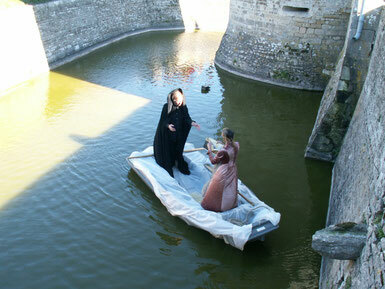 Evocation of Bossuet in the court of the chapel, tour outside the castle, scenic evocation and dance in the moat, and then in the park facing east. 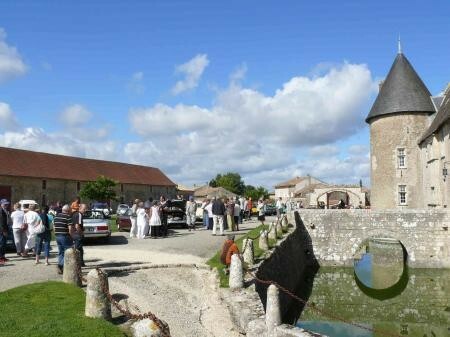 Date: WYD from August 19 to 24 1997, Paris, France. 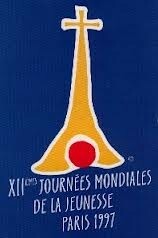 The 1997 edition is the XIIth WYD - World Youth Day. 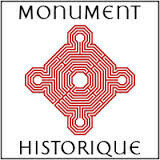 It is a movement organized by the Roman Catholic Church. 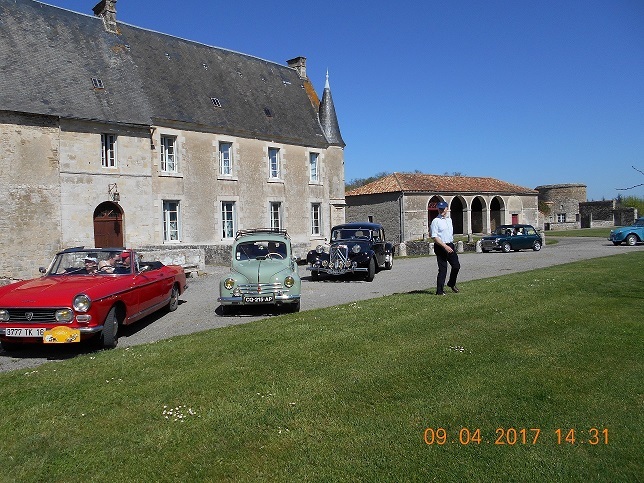 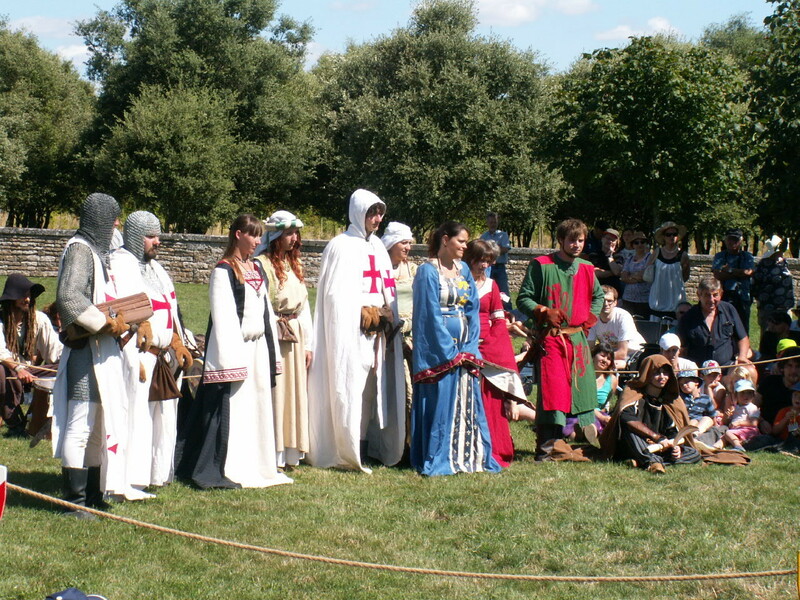 Thanks to the diocesan days and to the youth festival that preceded them, groups of young people went through Chateau de Saveilles. 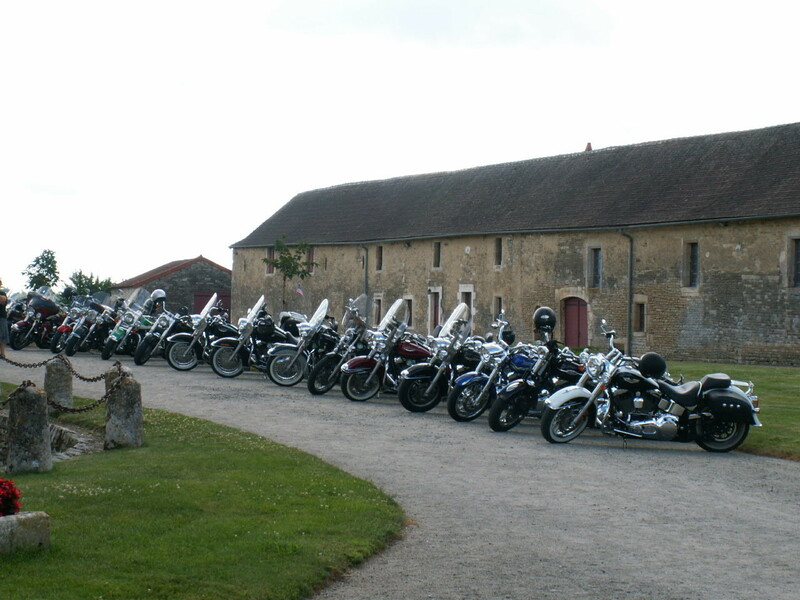 We all remember the high mass, meetings, times of prayer, joy and dynamism.